On Wednesday 15th August, we keep the solemnity of the Assumption of the Blessed Virgin Mary. This is a Holy Day of Obligation in which we are expected to attend Mass. 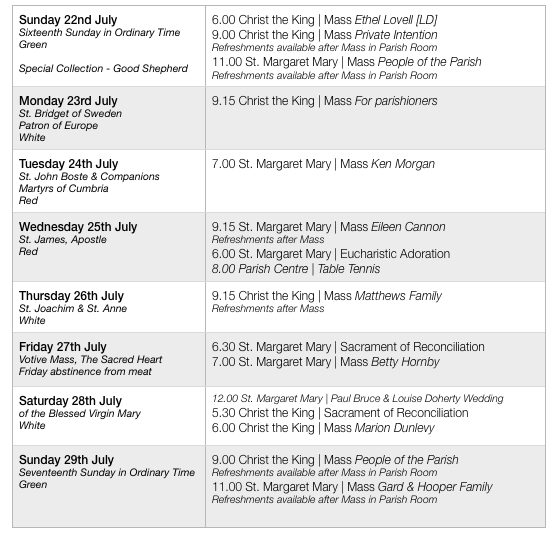 There will be a vigil Mass at St. Margaret Mary on the Tuesday evening [14th] at 7.00 pm, Mass at St. Margaret Mary at 9.15 am and at Christ the King at 11.00 am on the day itself. We have been asked, as a parish, to contribute £9000 towards the expected £75,000 build cost for a new chapel within the new Newman School. If you would like to make a donation towards the building cost, this can be made via cheque [‘Newman Chapel Fund’] or in cash. Please enclose in an envelope marked ‘Newman Chapel Fund’. Holy Mass will be offered regularly at Newman School for the intention of benefactors. Please help the parish reach its total - small amounts are appreciated. Not available at time of printing. The refugee and migrant crisis is bringing a faraway world closer to us. What could lead people to leave their homes, communities and country to find a new life in Europe. How we can help? To find out more look at www.cowc.co.uk, email agill.cowc@gmail.com or phone Adrienne on 07881 488566. A spectacular and dramatic outdoor performance portraying the betrayal, death and resurrection of Jesus Christ is being planned for Saturday 13 April 2019, i.e. the day before Palm Sunday, in Carlisle City centre. The participation of all the churches is invited and there are many ways in which to become involved. Visit the website www.carlislepassionplay.org or e-mail the organisers - infor@carlislepassionplay.org. There is a rota to open and close St. Margaret Mary during the next two weeks - please sign up. 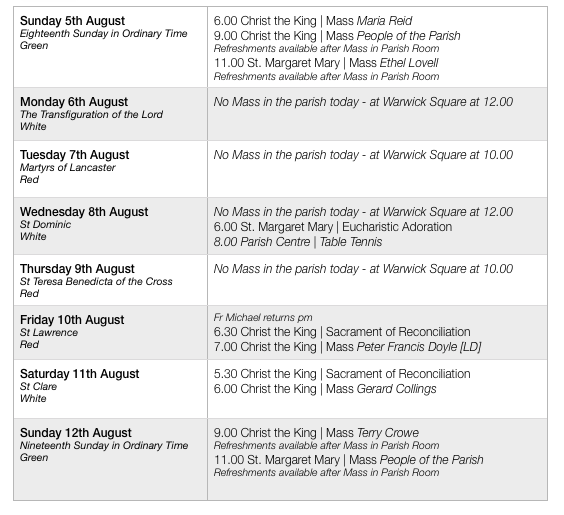 Fr Michael will be away on annual leave from Monday 30th July until Friday 10th August. 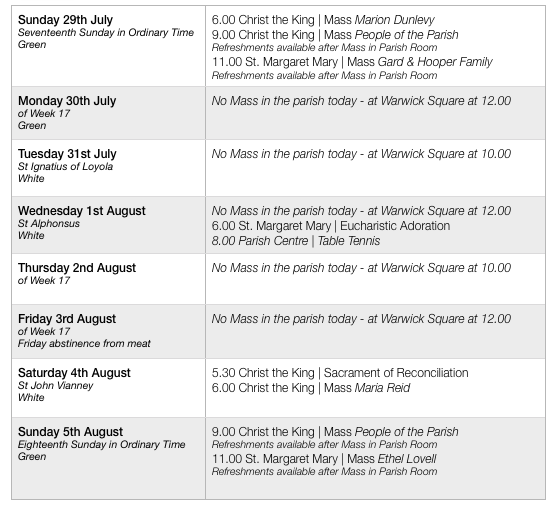 The weekend Masses will be covered by Fr Norman, who has kindly agreed to come and celebrate the Masses. There will be no weekday Masses during Fr Michael’s absence. If you need a priest in an emergency, please contact the clergy at Warwick Square . Now has a Christian resource centre selling a selection of Christian gifts, cards, Bibles, Christian books and CDs. If you have any Christian books and CDs that you no longer need, please consider donating them to Cornerstone. All money raised goes back into the running of Cornerstone to help develop the work they do within the community. Everyone, especially those who are ill, is invited to take part in our diocesan pilgrimage to the shrine of Our Lady at Cleator on Sunday 2 September. Mass and blessing of the sick - 3.00 pm. The Bishop will preside and preach. See the poster. Tea and coffee will be available before and after the pilgrimage in the parish room. For further details, contact St Mary’s Priory, Cleator on 01946 810324 or email stmandstj@gmail.com. 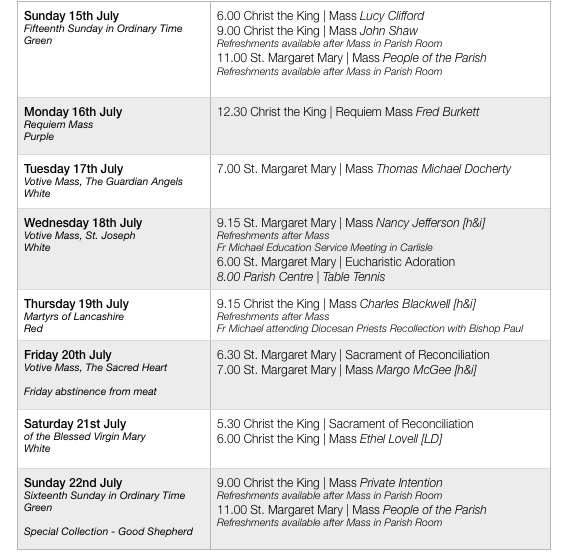 Last year we attended this pilgrimage as a parish with a lovely meal on the way home - if you are interested in joining a similar trip this year, please sign up on sheets. Hosted by the Cor et lumen Christi community, Brave of heart, 22-23 September, is designed for Catholic men to discover all that God has prepared for them. Talks, praise and worship, fellowship with other Christian men, time in the Lake District, Mass and prayer ministry. Donation only. For information, phone 016973 45623, visit www.coretlumenchristi.org or email stcuthberts@coretlumenchristi.org. We have been asked, as a parish, to contribute £9000 towards the expected £75,000 build cost for a new chapel within the new Newman School. If you would like to make a donation towards the building cost this can be made via cheque [‘Newman Chapel Fund’] or in cash. Please enclose in an envelope marked ‘Newman Chapel Fund’. Holy Mass will be offered regularly at Newman School for the intention of benefactors. Please help the parish reach its total - small amounts are appreciated. Last weekend there were 209 at Mass. The contribution to the offertory came to £613.43. Thank you. We acknowledge with thanks a donation of £1000 towards parish funds. To find out more, look at www.cowc.co.uk, email agill.cowc@gmail.com or phone Adrienne on 07881 488566. The Extended Family of the RHSM (St Gabriel’s Sisters) invite you to a Summer Garden Party to be held at the New Waterton Hall on Sunday 5th August from 2.00 pm to 4.00 pm. Cream teas and sandwiches will be served and there will be other attractions including a raffle. Tickets are £5 and are available in the churches. If you would like to donate a bottle for the raffle, please bring one along on the day. All proceeds from this event will go to support the various charitable activities supported and organised by The Extended Family. Tea and coffee will be available before and after the pilgrimage in the parish room. For further details, contact St Mary’s Priory, Cleator, on 01946 810324 or email stmandstj@gmail.com. Young people are invited to walk in pilgrimage from Castlerigg Manor, Keswick, to Cleator, beginning Friday 31 August. Details from Fr John Moriart on 01768 772711 or visit www.castleriggmanor.co.uk. We have been asked, as a parish, to contribute £9000 towards the expected £75,000 build cost for a new chapel within the new Newman School. If you would like to make a donation towards the building cost this can be made via cheque [‘Newman Chapel Fund’] or in cash. Please enclose in an envelope marked ‘Newman Chapel Fund’. Holy Mass will be offered regularly at Newman School for the intention of benefactors. We’re grateful for recent donations of £100, £100, £100, £30 and £1,000. Parish total so far is £8,500. Please help the parish reach its total - small amounts are appreciated. Thank you to all who have contributed towards the summer food parcels for local families and those in need in the local community. Last weekend there were 200 at Mass. The contribution to the offertory came to £646.19. Thank you. To find out more look at www.cowc.co.uk, email agill.cowc@gmail.com or phone Adrienne on 07881-488566. The Extended Family of the RHSM (St Gabriel’s Sisters) invite you to a Summer Garden Party to be held at the New Waterton Hall on Sunday 5th August from 2.00 pm - 4.00 pm. Cream teas and sandwiches will be served and there will be other attractions including a raffle. Tickets are £5 and will be available in the churches soon. If you would like to donate a bottle for the raffle, please bring one along on the day. All proceeds from this event will go to support the various charitable activities supported and organised by The Extended Family. A spectacular and dramatic outdoor performance portraying the betrayal, death and resurrection of Jesus Christ is being planned for Saturday 13 April 2019, i.e. the day before Palm Sunday, in Carlisle City centre. The participation of all the churches is invited and there are many ways in which to become involved. Visit the website www.carlislepassionplay.org or e-mail the organisers: infor@carlislepassionplay.org. The Bishop is leading a pilgrimage to the national shrine of Our Lady, Walsingham, Norfolk: Thursday 2 – Friday 5 October. Note the change of date from that advertised initially. More details from the organiser, Paul Briers at guildshop@yahoo.co.uk or 01946 834834. Food items most needed: tins of meat (mince, hotdogs, casseroles and stews, ham, corned beef), tins of fish, tins of fruit, tins of rice pudding, packets of custard, dried potato, dried pasta or rice meals, multipack cereals, UHT milk, biscuits, dried packets of sauce mix.” Food items can be left at Christ the King - there is a basket in the porch - larger items can be left behind the gates of the Last Supper Chapel: please help if you can. We have been asked, as a parish, to contribute £9,000 towards the expected £75,000 build cost for a new chapel within the new Newman School. If you would like to make a donation towards the building cost, this can be made via cheque [‘Newman Chapel Fund’] or in cash. Please enclose in an envelope marked ‘Newman Chapel Fund’. Holy Mass will be offered regularly at Newman School for the intention of benefactors. We’re grateful for recent donations of £200 and £250. Parish total so far is £8,070. Please help the parish reach its total - small amounts are appreciated. Last weekend there were 231 at Mass. The contribution to the offertory came to £657.96. Thank you. The refugee and migrant crisis is bringing a faraway world closer to us. What could lead people to leave their homes, communities and country to find a new life in Europe? How can we help? To find out more look at www.cowc.co.uk; email agill.cowc@gmail.com or phone Adrienne on 07881-488566. The Extended Family of the RHSM (St Gabriel’s Sisters) invite you to a Summer Garden Party to be held at the New Waterton Hall on Sunday 5th August from 2.00 pm to 4.00 pm. Cream teas and sandwiches will be served and there will be other attractions, including a raffle. Tickets are £5 and will be available in the churches soon. If you would like to donate a bottle for the raffle, please bring one along on the day. All proceeds from this event will go to support the various charitable activities supported and organised by The Extended Family. A spectacular and dramatic outdoor performance portraying the betrayal, death and resurrection of Jesus Christ is being planned for Saturday 13 April 2019, i.e. the day before Palm Sunday, in Carlisle City centre. The participation of all the churches is invited and there are many ways in which to become involved. Visit the website: www.carlislepassionplay.org or email the organisers: infor@carlislepassionplay.org. More details from the organiser, Paul Briers: guildshop@yahoo.co.uk or 01946 834834. Hosted by the Border Kirk & St George’s URC, on third Tuesday of the month, the next one being held on Tuesday 17 July at 2.00 pm in St George’s URC, West Walls, Carlisle CA3 8UF. A short informal service open to everyone, especially those with memory loss, their family and carers. Refreshments afterwards. For more information, contact Rosalind on 016973 44892. From Monday, St. Margaret Mary will be open for personal prayer during the day from around 8.00 am until around 6.00 pm [or after the last liturgy of the day]. If the parish priest is away, a rota will be in place for volunteers to open and close the church. If you are able to take responsibility for a particular day, please sign up.